Earlier this week I started paying very close attention to the weather forecast for today (Thursday). There was a cold front coming into the area, expected to exit late on Wednesday and I was hoping that it would provide the classic post-frontal soaring that we glider pilots long for in the Bay Area. Everything was looking good except for the wind. The pressure gradient was still strong and that set us up for a 15-20 knot wind out of the north/northwest. But there were predicted to be good cumulous clouds (indicators of rising air), so I figured it was worth cashing in a day of my accumulating vacation time. As I drove to the airport this morning, the clouds looked amazing. I was kicking myself for not having started an hour sooner. But I'd seen days like this before and wasn't too worried. 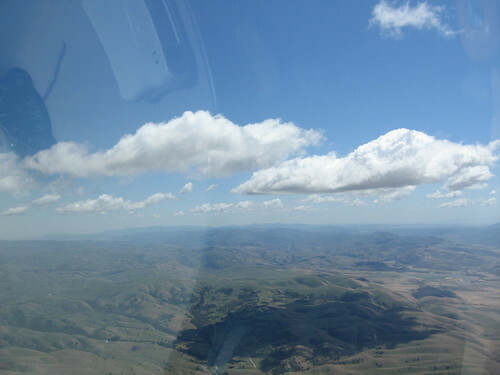 However, as I was assembling my glider, the clouds started to vanish. The atmosphere was beginning to dry out a bit. They didn't completely vanish, but I'd say their intensity was reduced by a good 60-75% or so. Around 12:45pm I launched off runway 31 at Hollister, following the lead of the few pilots who had launched before me. Before long, I was off tow at 3,300 and struggling to stay up. The lift was hard to find and hard to stay in, but I kept at it. It took an hour to get above 3,700 and I nearly had to land once. But eventually it got better. I maxed out around 6,000 feet and managed to fly around and explore a bit. But after two hours of the 20 knot headwinds and ripped thermals, I'd had enough of bouncing around and headed in to land. All in all, it wasn't the day I hoped it would be. But it was certainly good practice. I'm really hoping that the Spring soaring season is going to kick off soon. We could really use a few good days. Is there special jargon amongst glider pilots, dude? 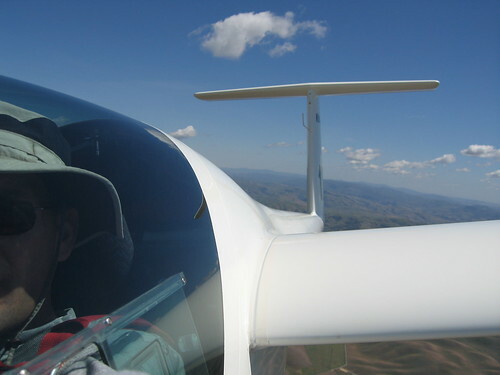 A bad day gliding beats a good day working any day! Your gliding pics are guiding me through the grey drippy malaise we're mired in out east.